Don’t think Darth Vader only fights against his enemies with the dark side of the force. What can be done with the power? The following Star Wars Darth Vader ultrasonic humidifier is a nice answer. This is a pretty cool and practical ultrasonic humidifier themed by Star Wars. The humidifier measures 10-3/4 x 11 x 11-1/2 inches and weights 3 lbs. As we can see from the images, it’s shaped as Darth Vader’s symbolic black helmet and features highly exquisite details from its original design, and unlike that R2-D2 humidifier, there is no an custom opening on the top of the helmet, so you don’t worry about a water bottle affecting the replica’s integrity. The Darth Vader helmet shaped humidifier comes with a 1/2-gallon water tank that can hold enough water to humidify your room for up to 12 hours with 10 moisture settings, and its auto-off function ensures the humidifying process using the dark side of the force is safe, meanwhile, a built-in night light lets you clearly see how the gentle soothing mist is dispensed from the top of the Darth Vader’s helmet. 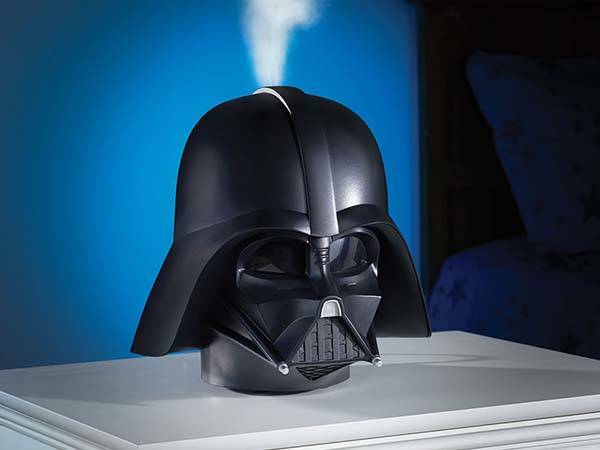 The Star Wars Darth Vader ultrasonic humidifier is priced at $99.95. If you’re interested, jump to Hammacher Schlemmer for its more details.